I stitched 10 mittens and 10 stockings. The designs are from A Design by Lyn. 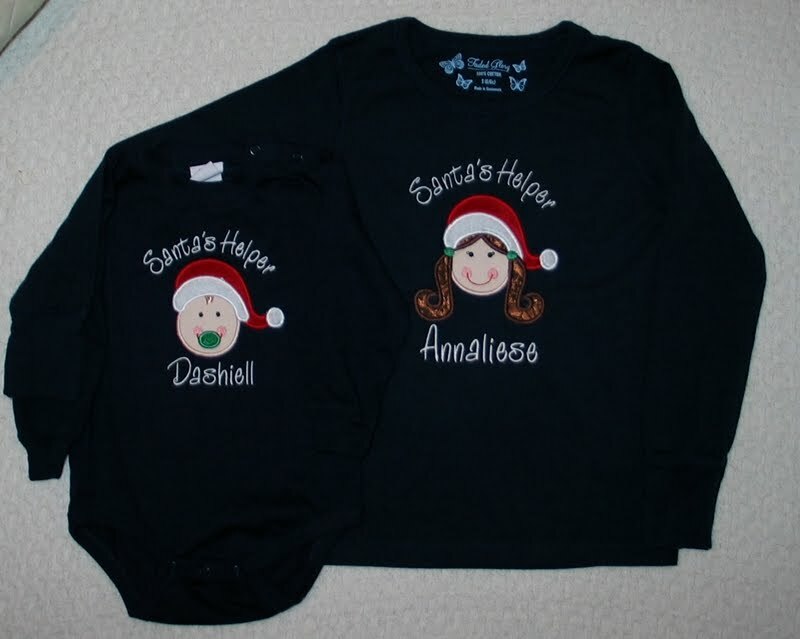 Yesterday I stitched matching Christmas shirts for Annaliese and Dashiell! Santa Hat Girl (5x7) for Annaliese and Santa Hat Baby Boy (4x4) for Dashiell. 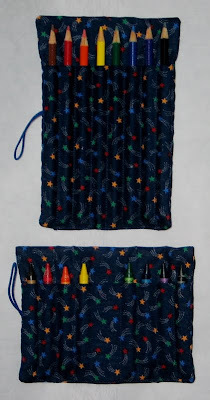 I even stole Lyndsie's text idea from a project she posted on Sew Forum. I used Bingham font from 8 Claws and a Paw. Man, they are so stinking cute!!! 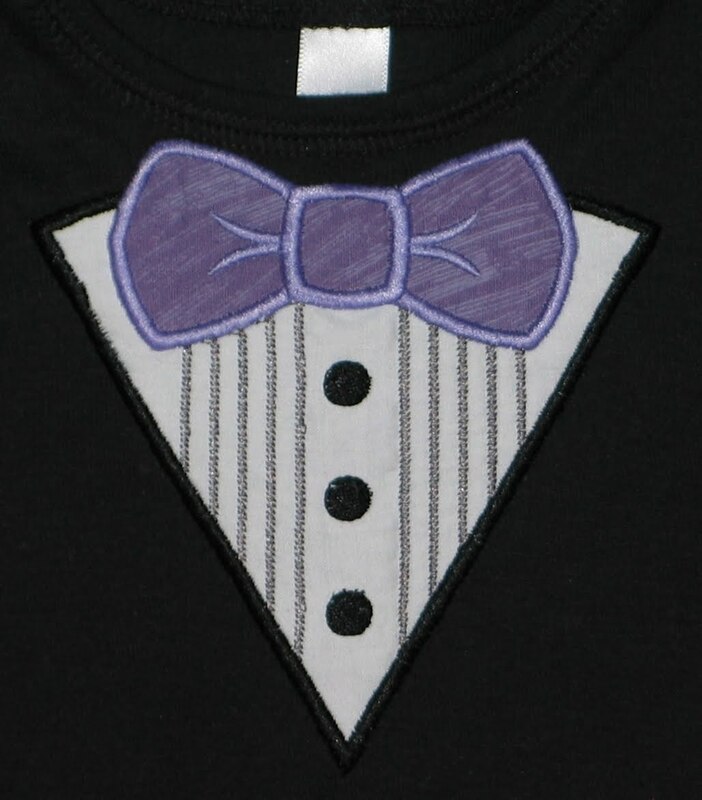 The design is from Embroidery Library. I thought it was perfect for a kindergarten teacher! Kathy digitized the text for me using the font Andy. 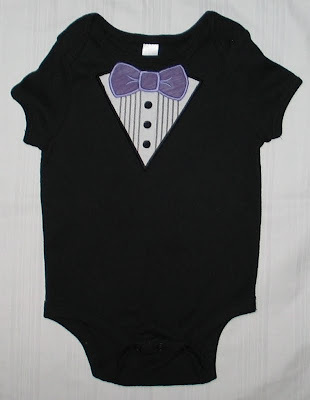 At the end of March I stitched a tie onesie and bib for Dashiell using the tie applique design from GG Designs (he's even featured on her site!). Everyone that saw him in either his bib or onesie got a kick out of it, and I've had a few orders for similar items since. I picked the purple material for the bow tie to match Annaliese's dress. 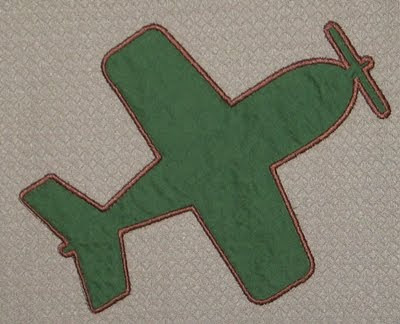 I spent the last five days stitching exclusively for my friend Andrea! 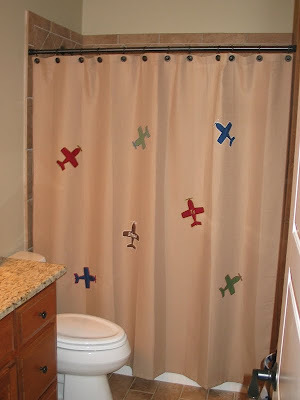 At the beginning of the week I appliqued seven airplanes on a shower curtain for her boys' bathroom. She has been hunting for something to coordinate with their bedding and couldn't find anything. So she bought a plain shower curtain, coordinating fabrics, and requested I use contrasting thread. It was a challenge, I learned a lot, and thankfully the whole family was thrilled with the results! 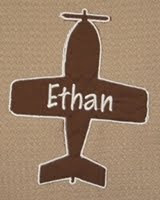 I used Embird Alphabet #8 to add their names to two of the planes. 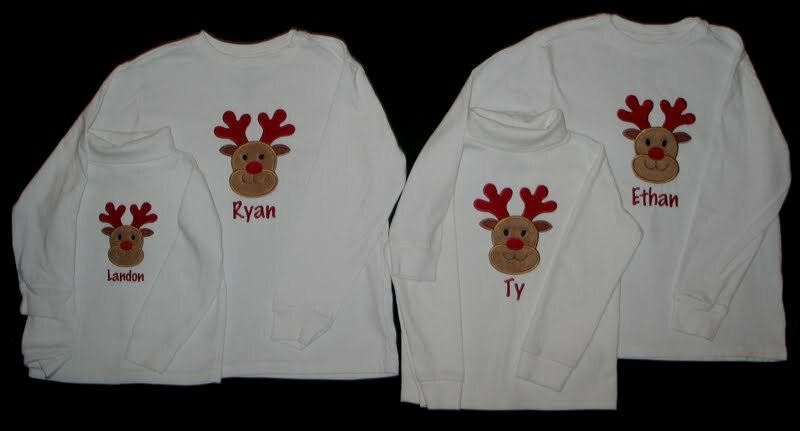 Once I completed that, I tackled a set of matching Christmas shirts for her boys and nephews. The applique reindeer is from Designs by JuJu. I used the 4x4 size for the youngest, and the 5x7 for the other three boys. 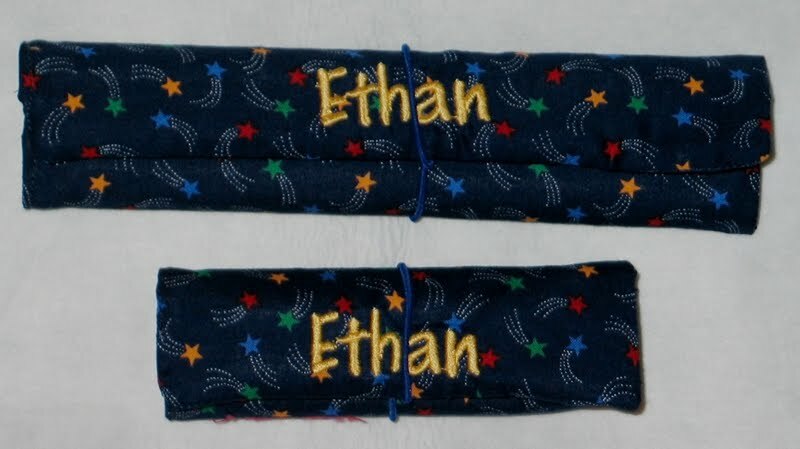 Andrea's boys have matching red corduroy pants -- I cannot wait to see a picture of them!! 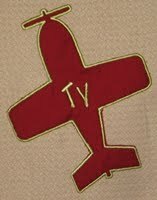 Last year for my husband's birthday I digitized his logo and stitched it on a bulletin board for him. 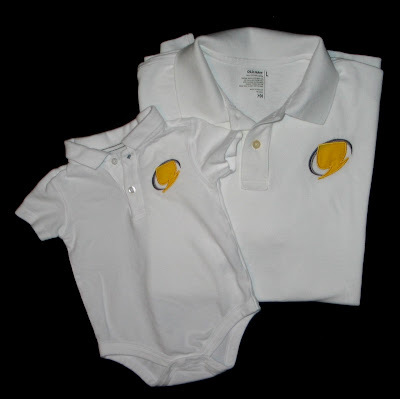 Earlier this year I sent a small version of the logo to Kathy, who stitched it on a polo onesie for Dashiell and also mailed me a blank white polo so I could do the same for Carlin. Sadly I never made time to stitch it, poor guy. BUT that turned out to be a good thing. 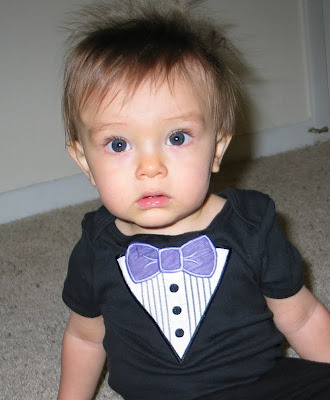 Carlin has significantly shrunk over the last several months, and that shirt is now way too big! 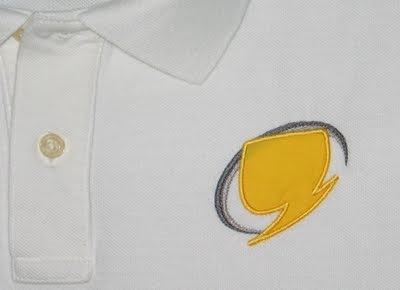 This year for part of his birthday gift I stitched his logo on a new, smaller sized polo. I also stitched another for Dashiell, who has outgrown the one Kathy made. 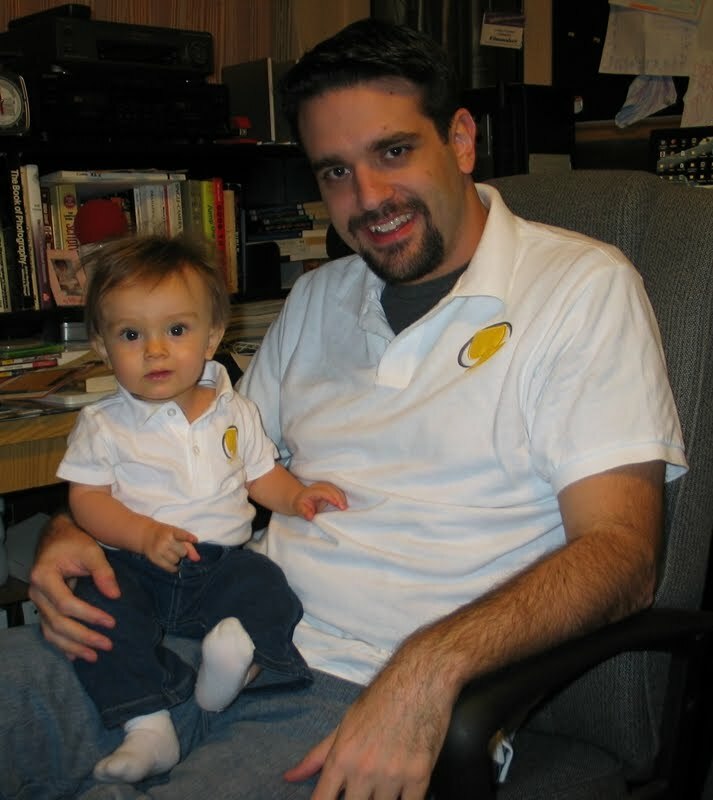 Here they are, all matchy-matchy, Mr. Dashiell Trammel and Mr. Carlin Trammel. 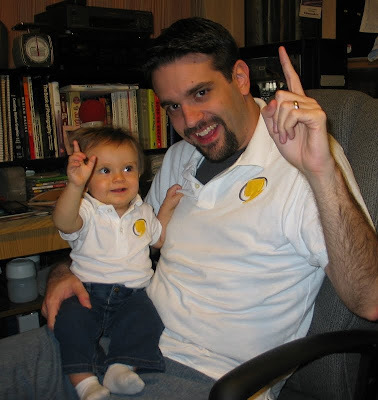 I doubt it will happen as often as with me and Annaliese, but I'll give it a shot as often as my boys will let me! A year ago Shannon and others threw us a nice baby shower at Carlin's work. 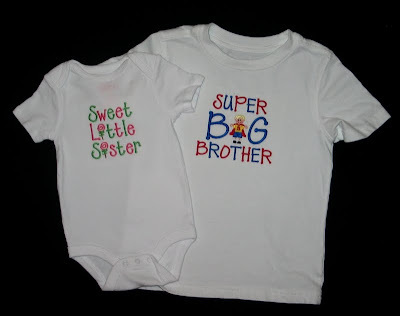 Today was Shannon's turn to be showered with gifts for her expected baby girl! 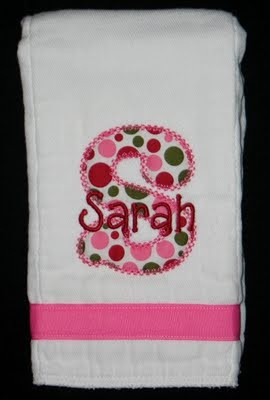 Rumor has it they plan to name their little girl Sarah (and if her name changes I'll just swap it out of an accurate one later). The S is from Embroidery Boutique's Vintage Applique Alphabet and I used Itty Bitty Alphabet from 8 Claws and a Paw for her name. 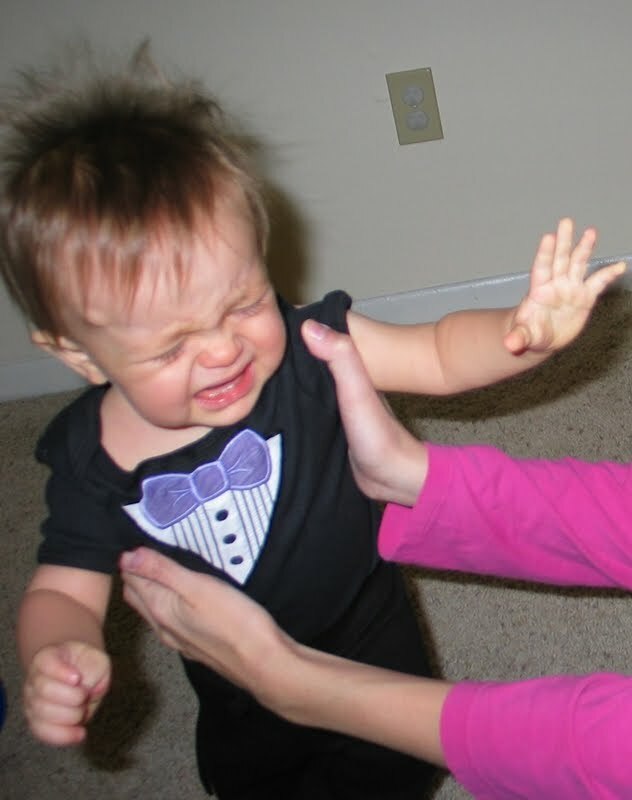 Shannon danced with the Tallahassee Ballet, and maybe her daughter will do the same! 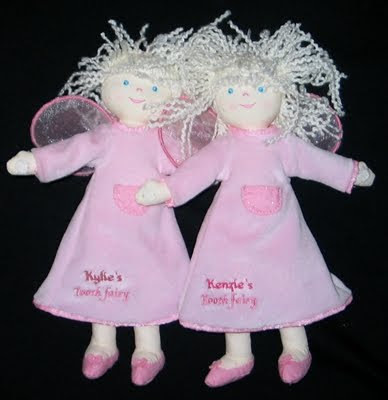 The ballet shoes design is from Nobbie Neez Kids. 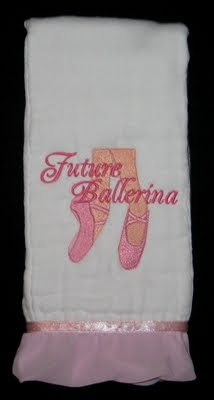 I added "Future Ballerina" with Embird Alphabet #38. Instead of my usual row of ribbon, I found this pretty trim that reminded me of a ballerina tutu. 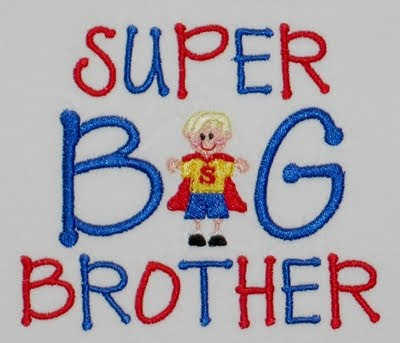 Jack is really into superheros, so when I saw Nobbie Neez Kids' Tiny Superboy design, I decided to replace it for the "I" in BIG and make him a "SUPER BIG BROTHER" Shirt! The rest of the text is from Itty Bitty Alphabet from 8 Claws and a Paw. 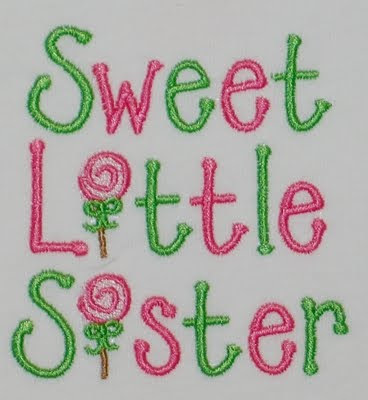 I opted for the adjective "sweet" for the baby girl, and used NNK's Lollipop Teeny to replace the "i"s in "Sweet Little Sister". 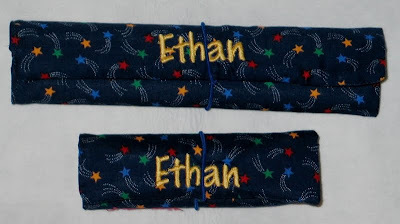 I used the same font, but stitched lower case letters instead, and used pretty little girl colors. 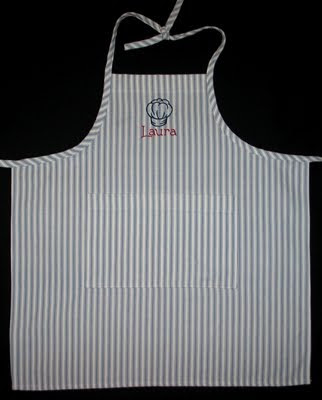 Rosanne bought an apron for her niece that she wanted monogrammed. 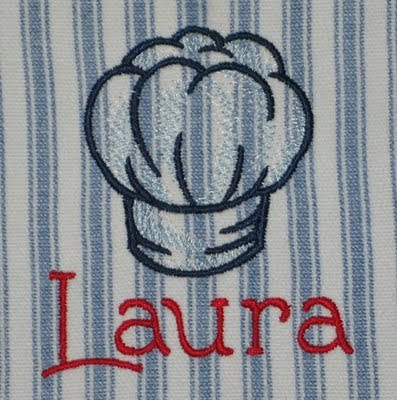 We settled on a chef's hat from Embroidery Library, and stitched Laura's name with 8 Claws and a Paw's Lizzy Font. 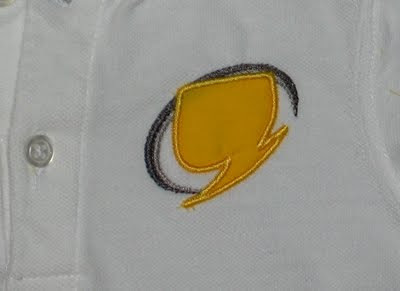 As usual, designs from both places stitched perfectly!! Two weeks ago today in the middle of church Annaliese discovered that one of her bottom teeth was loose! 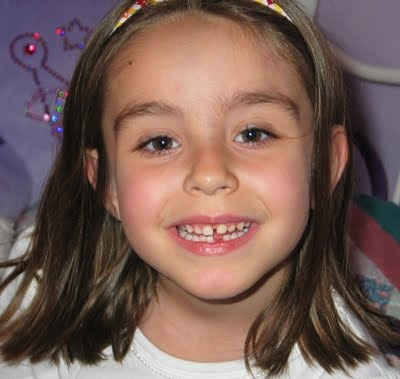 I COULDN'T BELIEVE IT -- MY BABY HAD A LOOSE TOOTH! Once I got over that shock, I realized I needed to quickly get to work on her tooth fairy pillow. 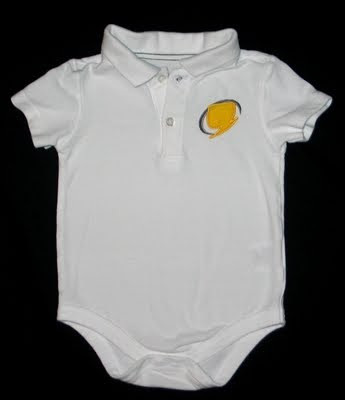 Thankfully I had already been brainstorming ideas, it was just a matter of finalizing the design and getting to work. 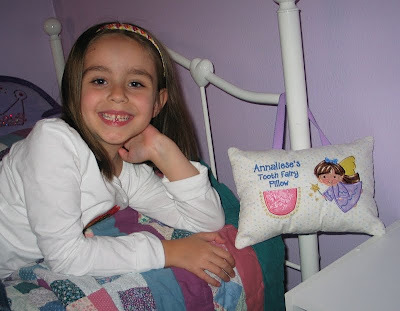 I got the pillow done within a week, but decided to wait until she actually lost the tooth to give it to her. Well, that happened today at lunch! 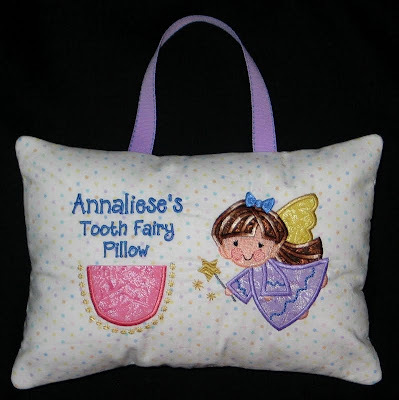 Annaliese's pillow is hanging by her bed, tooth safely tucked inside, awaiting the fairy! I can't believe it's November! 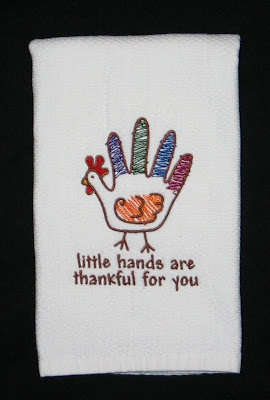 I stitched Dashiell's First Thanksgiving bib. 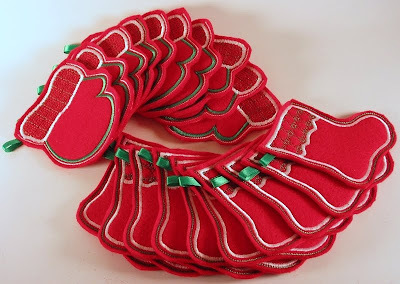 I LOVE these designs from Embroidery Library. 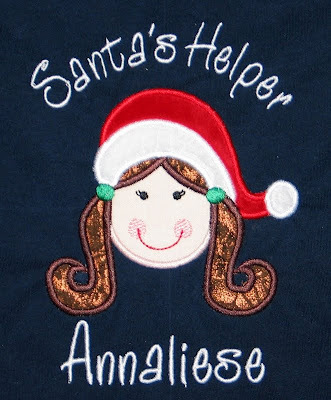 Kathy digitized the text for me again. 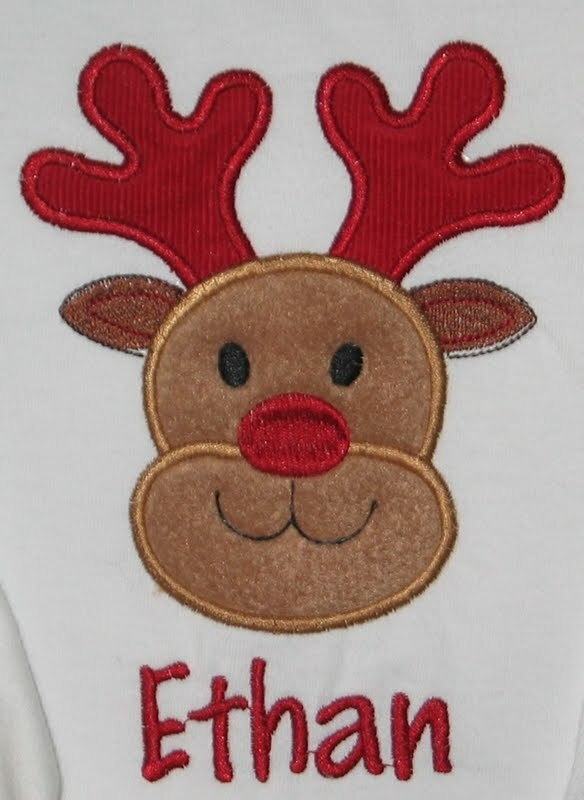 When I showed this bib to Carlin he said, "That's going to be one messy bib!" 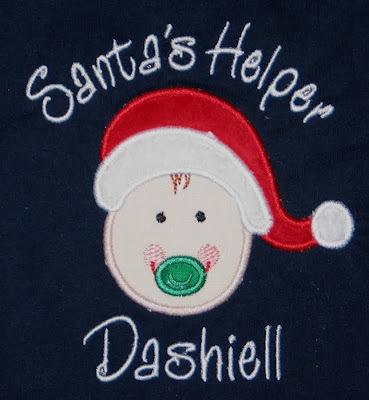 All the other first holidays were before Dashiell started solids and feeding himself. Glad I remembered to take a picture before we used it for the first time! 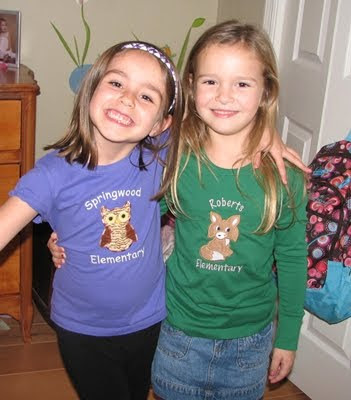 For Madison's birthday gift we decided to make her a shirt to show school spirit, much like the one Grandma Kathy made Annaliese. 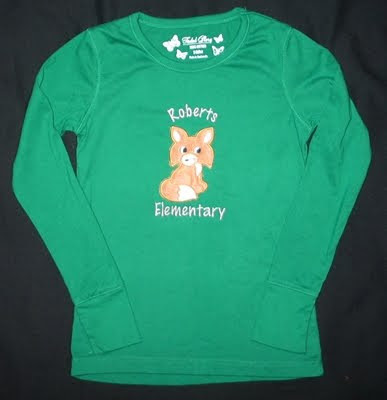 Madison's school mascot is a fox, and their school colors are green and silver. 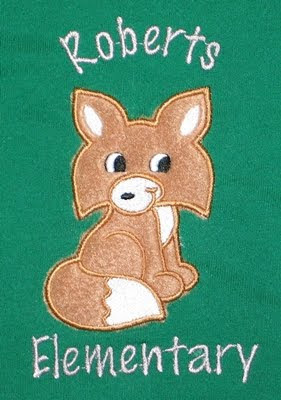 The applique fox is from Embroidery Library and I used fleece, so it's extra fuzzy and soft! I added the text with Embird Alphabet #8. Friday we got together for a play date, the girls were so excited to be together! 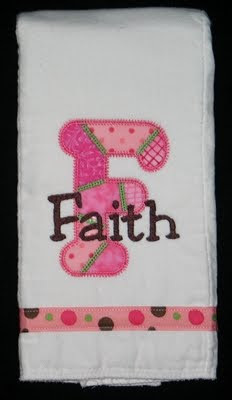 For Faith's burp cloth, Michelle requested Five Star Font's Scrappy Applique. I went on a hunt for a font that had rounded serifs, and settled on 8 Claws and a Paw's Jester font for "Faith". For Summer's burp cloth, Michelle asked if there was anything new I wanted to try. 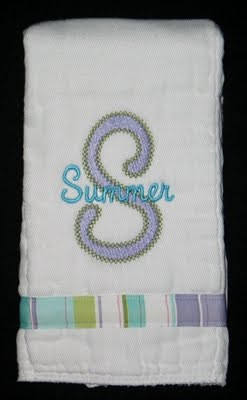 I realized I have a beautiful stacked monogram set that I bought well over a year ago that I still haven't stitched! 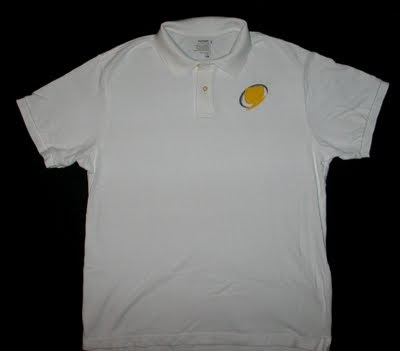 This monogram is Vintage Chloe from Embroidery Boutique. Kylie has lost her first tooth! As soon as she noticed wiggly teeth (in September), Valerie got to work on finding something special for the girls to use for visits from the Tooth Fairy. 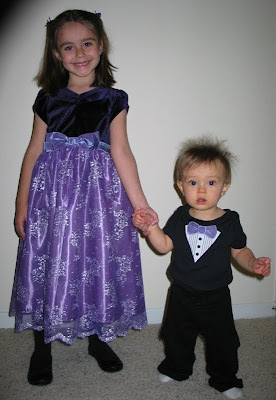 She found these cute fairy dolls that have a tooth pocket on the dress. 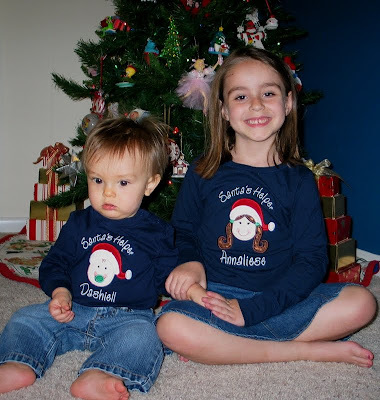 Valerie brought them to me to personalize. We decided to add their names above the "Tooth fairy" text which was already there. I wish I could have mixed the two. Oh well, they are cute none the less! This project got me thinking that I might need to come up with a Tooth Fairy solution myself within the next year. Thankfully I started brainstorming right away, considering making a pillow with one of the angel designs from Designs by JuJu... third row, second angel -- isn't she cute?? A week and a half ago, Annaliese noticed a loose tooth! I'm so glad I had put thought into it already. Within a few days I finalized my design and made the pillow. BUT we've decided to wait until she actually looses the tooth to give it to her, so you'll just have to wait in anxious anticipation to see it. It is VERY cute!